Republican Scott Brown and Democrat Martha Coakley debate in Boston, Massachusetts, on Monday. Washington (CNN) -- A contentious special election to fill late Sen. Ted Kennedy's Senate seat could have an effect on the cause he championed -- health care. 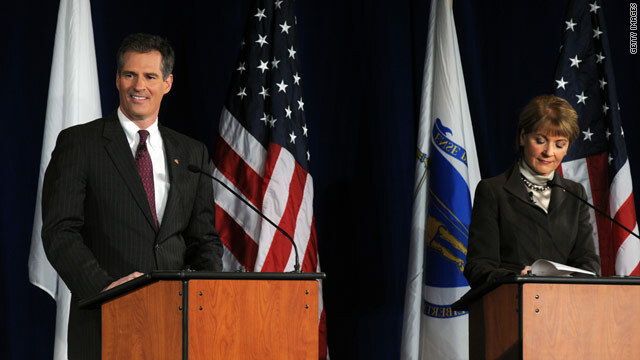 Republican candidate Scott Brown, a state senator, is facing off against Massachusetts Attorney General Martha Coakley. Election Day is January 19. Recent polls suggest the race may be closer than expected in its final days, though the Democrat still holds a 15-point advantage in the overwhelmingly Democratic state. No Republican has won a Senate seat in Massachusetts since 1972. CNN political analyst David Gergen, who moderated a debate between Brown and Coakley Monday night, said part of the closeness of the race is tied to the health care reform bill in Congress. "And his campaign has gotten a lot of traction suddenly, unexpectedly in the last few weeks by exactly that campaign pledge: 'I will send this bill back,'" Gergen said. Democrats hold a 60-40 filibuster-proof majority in the Senate, but if the Massachusetts seat goes to a Republican, Democrats would lose their supermajority. "With all due respect, it's not the Kennedy's seat, it's not the Democrats' seat, it's the people's seat," Brown said. "They have a chance to send somebody down there who's going to be an independent voter and independent thinker -- and going to look out for the best interests of the people of Massachusetts." Coakley said that she'd be "proud" to be the 60th vote to get health care reform passed. Gergen points out two strategies Democrats can use to pass health care if Brown is elected. "One is, they could simply have the House pass the Senate bill and never send it back," he said. "That would be a huge compromise [since the bill] would have no changes and of course they [Democrats] want changes." The Democrats could also push to extend the vote count, Gergen said. "Massachusetts officials have 10 days to count the votes. And what if they took every one of those 10 days," Gergen said. "Conceivably, the Democrats could go ahead and get it done in Washington." Meanwhile, the Democratic Party's top donors were urged Tuesday to open up their wallets for Coakley as party leaders scramble to provide her with the financial resources needed to win, a Democratic Party source told CNN. Up to 500 donors were expected to participate in an afternoon conference phone call led by Tim Kaine, the Democratic National Committee chairman. The goal is to raise "in the significant six-figure range in the next 48 hours," the source said. Separately, the DNC is expected to inject $500,000 into the race, the source noted. A DNC spokeswoman would not confirm the call. CNN's Alexander Mooney and Mark Preston contributed to this report.